Dinosaur Comics - March 16th, 2011 - awesome fun times! 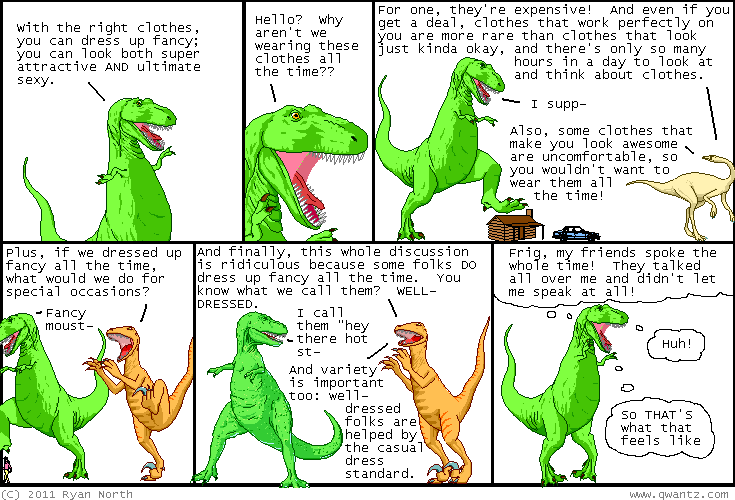 March 16th, 2011: If you are disconcerted by naked dinosaurs talking about clothes, try adding &butiwouldratherbereading=onewheretrexwearsmore to the address bar; that problem will be solved IMMEDIATELY. Japan is still recovering from that terrible earthquake and tsunami, please consider a donation to Doctors Without Borders or the Red Cross (American, Canadian, British) to help! One year ago today: poor toyota, first that huge recall and now a throwaway reference in dinosaur comics? WHAT'S NEXT? ?